This summer might be a dry one, but that does not stop unwanted growth from spreading around your roof. With temperatures on the rise, there are not many property owners who are getting ready to climb up onto smoking hot shingles. It is easy to put these chores off until a more convenient time, but the longer you wait, the worse these issues get. Instead of letting these things slide, just call a Gorilla for your roof cleaning and moss removal. The Canadian climate fluctuates day to day and coast to coast, but roof clutter is a constant. Organic debris can blow off of trees, be transmitted by the wind or begin to grow all on its own. The roof of your home or commercial space is easy to ignore, as it is primarily unseen throughout the day. Just because it is out of sight does not mean that your roof should stay out of mind. 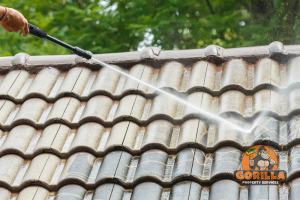 Your roof is always working hard for you, so it is only fair to make your roof cleaning and moss removal a part of your routine maintenance. By routine removal of organic clutter, and moss, you can extend the lifespan of your construction materials. Limit the amount of repairs, replacements and costs involved in taking care of your roof. When you call a Gorilla for your roof cleaning and moss removal, you are getting great results, done safely. Every Gorilla operates under insurance, so you can put your worries to bed and your feet up while your roof is being cleaned. Limiting the amount of debris that builds on your roof can also limit the spread of harmful moss. A roof cleaning and moss removal is not just about aesthetics, but about preserving the condition of your property.